Really cool headphones: from Transformers to Lego, meet twelve of the coolest earphones ever. 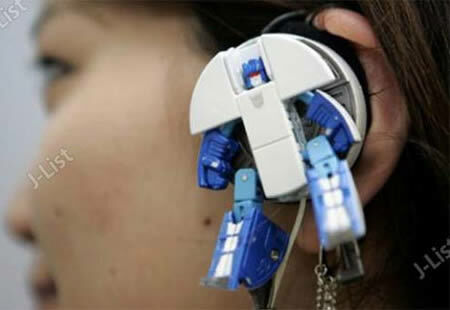 How many times have you wanted to wear Transformers on your ears? None you say? Well, that's just weird. These Transformer headphones allow you to wear your choice of Frenzy or Ramble on your ears. 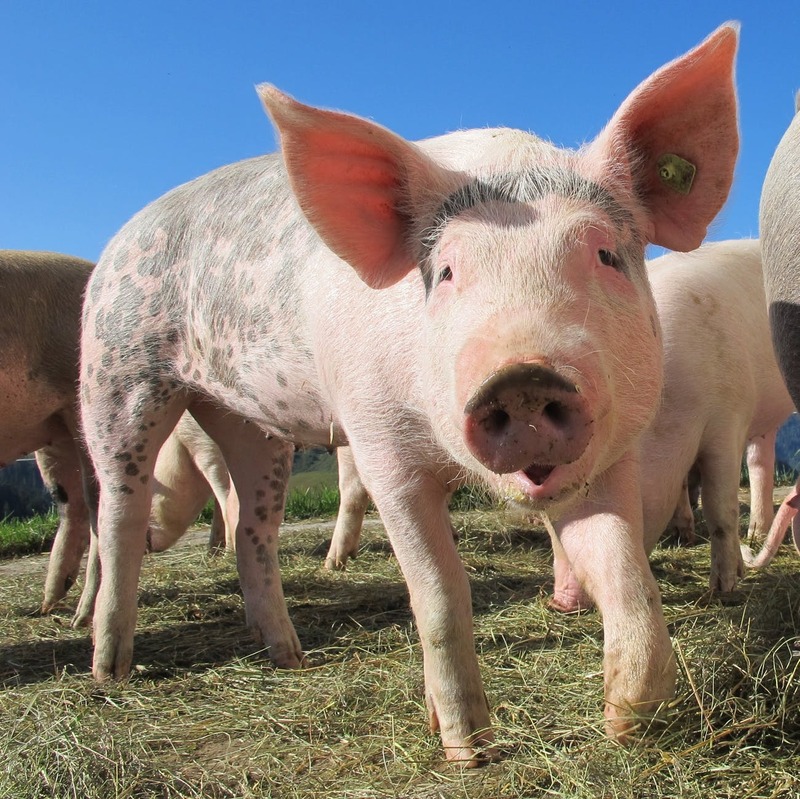 We just hope they don't transform into a bull horn or something while on our ears. The headphones come with a retractable cord for easy transportation and knot forming, and is a great way to show off your fanboy-ism to all of the other. 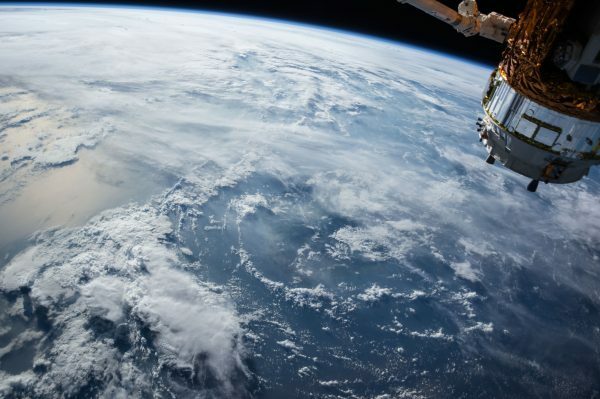 They Might Be Giants listeners of the world. 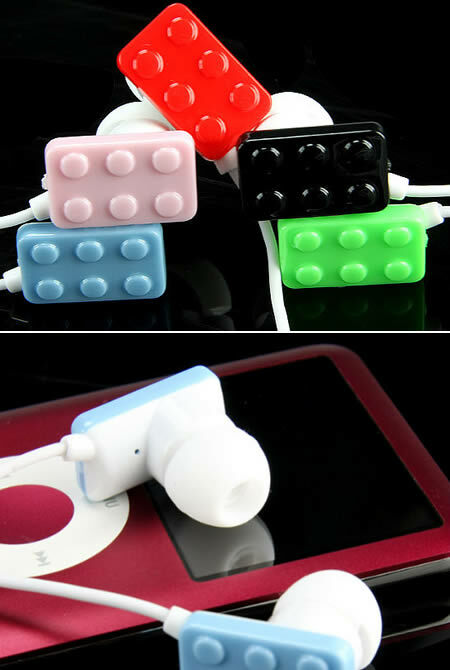 These colorful in-ear brick headphones features a standard 3.5mm stereo audio plug and there are five different colors for you to chose from: black, blue, green, pink and red. Available over at the Gadget4all.com website for $10. It's kind of a low-tech invention for people into piercings and other types of bod-mod! 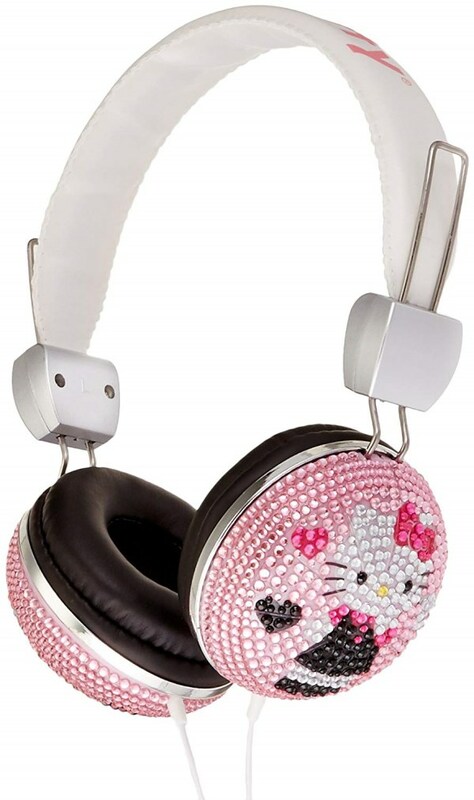 Cool new headphones from Kawaii are both angel and devil. Some say rock is the music of angels while others say it is the work of the devil. I wouldn't know which because where I live they've banned both rock music and dancing. 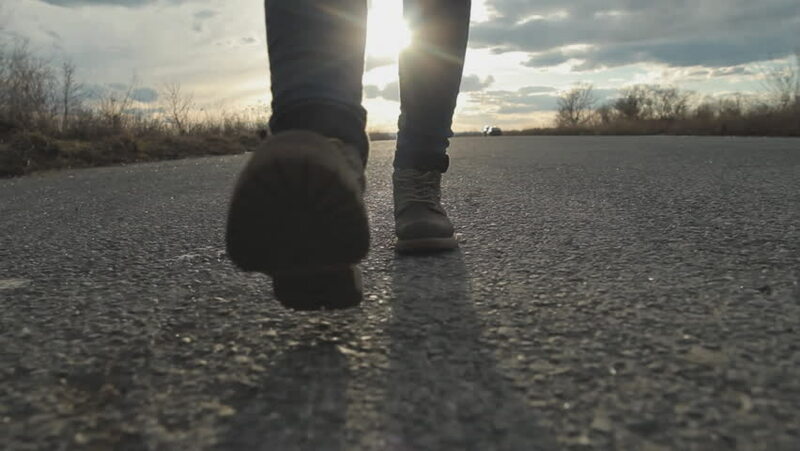 I'm holding out for a hero who will help me get around the law and have music at my senior prom so I can cut footloose which would be almost paradise. Fancy annoying the morning bus/train traffic with a pair of oversized plugs? 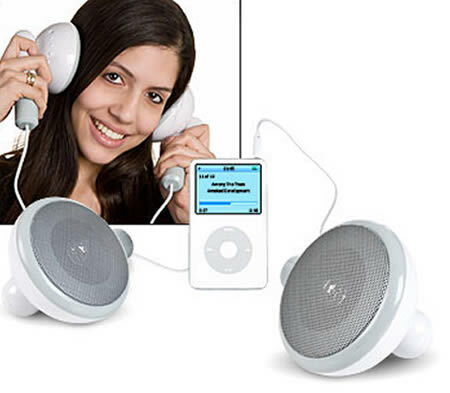 You can with the Giant Earphone Speakers. 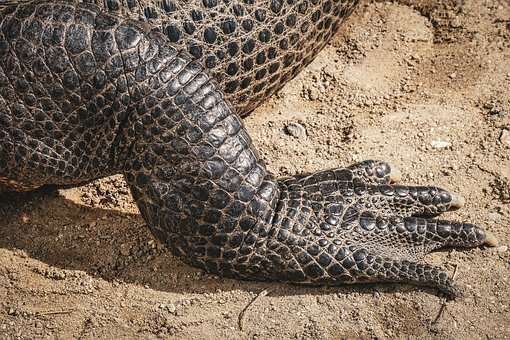 But only if you hold them to your head. You see, these are actually desktop speakers, shaped like earphones, but at 500 times the size. 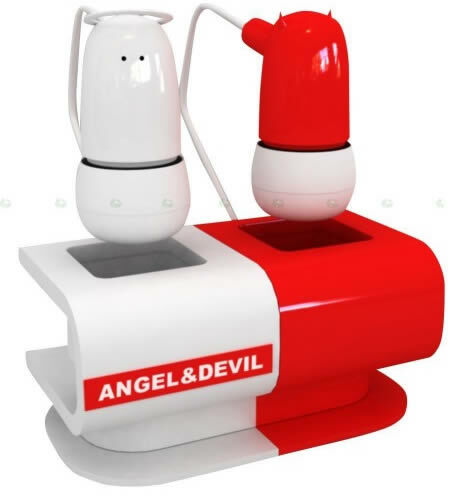 Power is via batteries or USB, with a main adaptor available separately if you prefer. 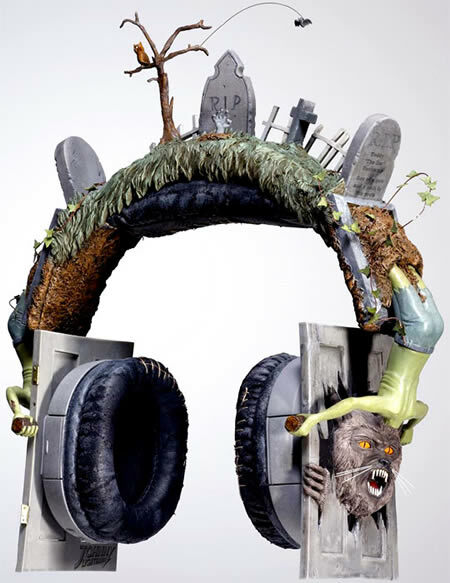 The Thriller Headphones, designed by Johnny Lighthands and built by ATOM Creative Solutions, won the Nokia headset design competition in 2008, featuring gravestones, zombies, and that creepy, yellow-eyed wolf bursting through the door. Though only one pair was made by Nokia into a working model, we hope that Jackson's passing inspires Nokia to produce at least a limited-edition run of the freaky-awesome headphones. Ears have always been your bejewelled part (even if you are a guy). Now you can add to your ear's bling quotient with the 18 carat gold, diamond-encrusted earphones! Each earphone, made by top jeweller Casa Gi based in Belgium, is encrusted with 59 of the highest quality diamonds that have been individually set in 18 carat gold. These listening devices give a crystal clear sound and a sparkling appearance. The 18 grams of gold makes the piece fairly heavier than the regular set of earphones yet they are just as comfortable, claim the makers. The earpieces are attached to a white wire with a standard jack that fits into most MP3 players and computers. 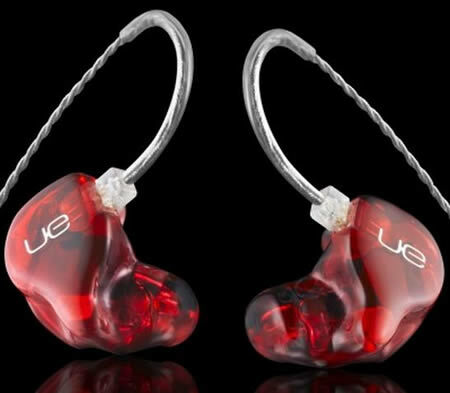 The only pair of Casa Gi earphones in the UK is currently on sale at Clive Ranger jewelry shop in Bristol for $ 3,499. Here's another method to try and solve the issue with what to do with all the extra cord that is not in use when listening to an mp3 player. 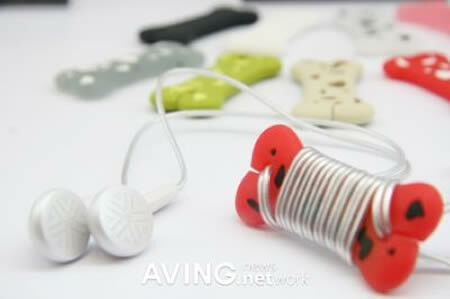 Bone Wrap, the bone shaped earphone cord wrap is the solution presented by Fruitshop. Bone Wrap is similar to the other simple methods of clearing the spare cords, the only difference is aesthetics. If you have a love for dogs and take your dog for walks daily, this might be a nice addition for your mp3 player during your walks with the dog. Earphones have always been big business for every audio company, and they have a lot of competition to deal with. This is because the earphone and headphone market is already saturated with many great products that are quite good, and in order to excel in the market, the new product must have that special something. This time around, Ultimate Ears have launched the Ultimate Ears 18 Pro custom monitors with the help of Logitech which come with an amazing 6 drivers in each earbud. You can imagine the quality of music that you might get when you use one of these pairs of headphones! There are 2 drivers for bass in each ear, and 2 each for mids and treble in each earbud. 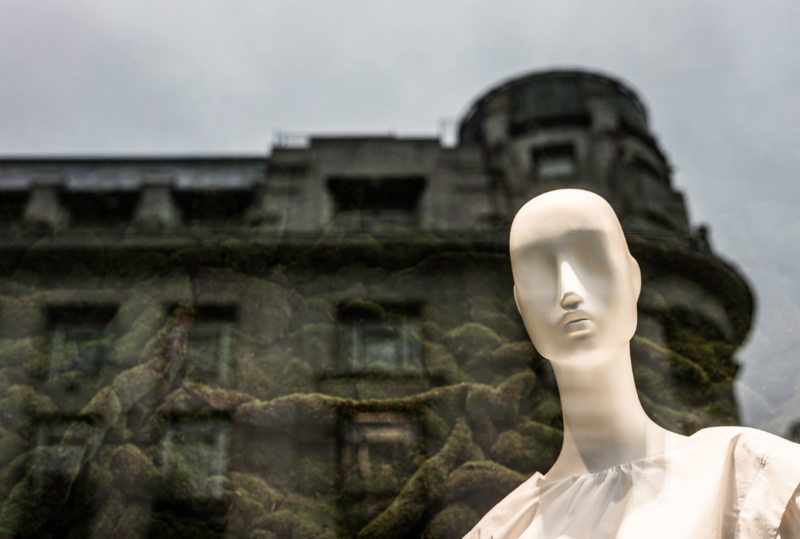 However, they cost quite a bit at $1,350. 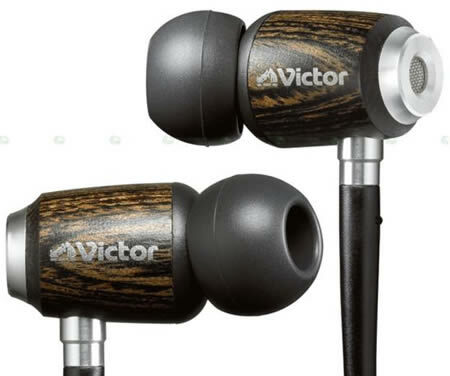 Recently, a new product has been launched in the market from JVC: earphones made of wood. The contemporary product is named HP-FX500. The special features of this trendy earphone is that wood promotes the audio quality and the piece weighs only 7.5 grams. It can be conveniently used by everyone. Its power measures 100dB/1mW, from 8Hz to 25kHz at the rate of 16 ohm. Finally, welcome some style in the earphone industry. 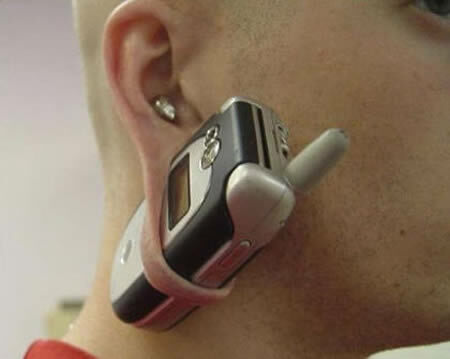 Radius took their earphones to the next level. The latest styles and trends that music enthusiasts are wearing these days are skulls. You will find skull logos on t-shirts, sweatshirts, pants, and even shoes. Just when you thought you had seen skulls everywhere, Radius breaks out the latest design on their earphones – the Ruffian Skull. 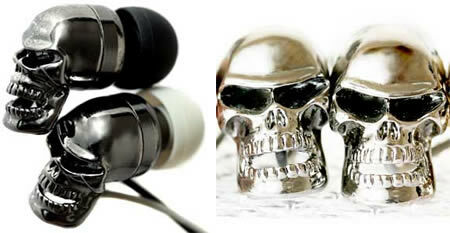 Putting fashion to the side, Radius Ruffian Skull Earphones also have great acoustics and can be worn inside of helmets. 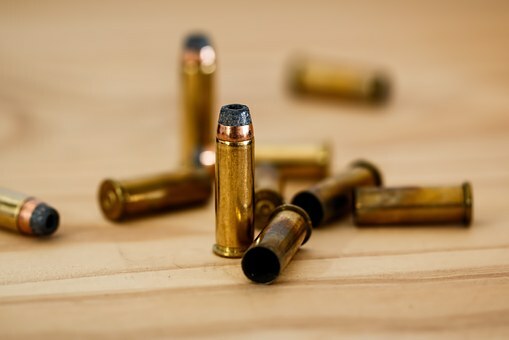 Maybe it's just because we had a rough weekend, but we still have to piece together what the purpose of this device is. 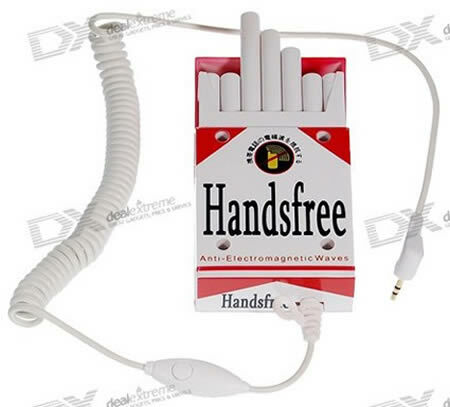 Officially, it's a novelty cigarette pack-shaped earphone headset for Nokia / Samsung / Sony Ericsson mobiles. That's to say it enables you to just talk into the pack rather than into your phone. At just $6.79, we'd love to say this would at least make a good gag gift, but honestly, we can't figure out what's to "get." Hmmph.